The Metis are the first Canadians – meaning the hybrid people created from the unions of First Nations and the initial immigrant Europeans settlers. The Metis evolved into a distinct, thriving indigenous people. During Canada’s fur trade period, the Metis women would bead articles for sale to participate in their household economy. Items beaded ranged from saddle bags and gun holsters to coats, mitts or moccasins. Despite the prolific popularity of these beaded items, they were never attributed to Metis women at the time. Reasons for this include the market demand for authentic items from "real Indians" (the Metis were not yet recognized as an indigenous group), and Metis families who were trying to blend in to a largely racist settlement society did not want to be found out as being of mixed blood by European community members or even the local Indian Agent. The traditional Metis design style is distinct. It is a blend of early First Nations geometric beading and highly detailed European floral designs. The mix evolved into a very stylized, colourful floral design. Due to the range of items that Metis women beaded, they popularly became known as the “Flower Beadwork People”. The distinctive Métis art, which is the blending of First Nations and European art forms into a new art form, is considered the first Canadian art form*. The piece shown above, the Moccushion, is a pillow (or cushion) but its construction is based on the traditional Metis-style moccasin. 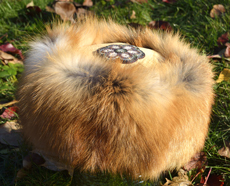 Materials used for the Moccushion are also common to the moccasin. Leather, fur, Melton wool and beads are used to handcraft the piece. The beadwork that makes moccasins so distinctive is used to decorate this hybrid cushion but is also used to symbolize a certain story or theme. The Trapper Hat (shown left) is based on the traditional construction of the type of headgear that was worn by Metis Voyageurs but redefined to suit a modern market. Beadwork has been added to the top of the hat thus turning into the wearer’s crown of sorts. 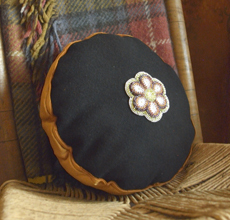 Just as with the Moccushion, the beadwork is inspired by a theme or some aspect from the wearer’s personality. *“The New Peoples: Being and Becoming Métis in North America”, edited by Jacqueline Peterson and Jennifer S. H. Brown, The University of Manitoba Press, 1985, ISBN: 0-88755-617-5.